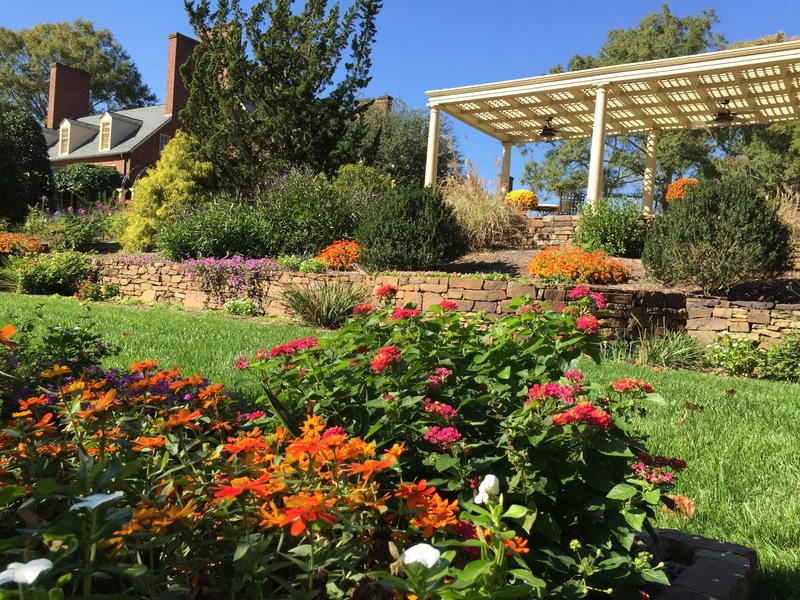 We’re less than a month away from the beginning of the second Scholarly Communication Institute held in the Research Triangle area of North Carolina, and are looking forward to this year’s cohort coming to Chapel Hill for five days of thinking, planning, and doing in a collaborative and relaxed setting. Last year, the first year of SCI in it’s new home, most of the participants were from the local area, and we tested out a new model for how such an institute might work. By all accounts it was a great success, and this year participants are coming from far and wide – from all across the United States, and about one third from other countries too, including as far away as Perth, Australia. What do we do during these Institutes? About a third of the schedule is unstructured, what we call “team time”. Each of the invited participants is part of a team working on a project they proposed during the RFP process – they set their own goals, process, and deliverables. During the team times there are no rules – teams can brainstorm, research their topics, run a charrette, document plans, develop software, write a paper, test models – last year participants did all of these things and more during their unstructured team times. Another third of the schedule involves the entire cohort in discussions together, what we call “plenary” meetings. During these sessions all the teams come together in conversations regarding issues of mutual interest to all of their projects. Some of these sessions start with a focus on a particular team’s project, allowing them to seek advice from the broader group on issues that are challenging them, or to seek feedback on ideas they are trying to advance. Other plenary sessions are conversations guided by several facilitators, who throughout each day have been engaging with each of the teams, and listening for and suggesting areas of intersection between the different projects. The final major piece of the schedule is social time. We know that often the best insights come when you’re not necessarily looking for them, but rather over a meal, or drinks, or when taking a walk someplace you haven’t been before. So we’ve built a lot of time for that into the schedule. Breakfast and lunch each day will be in the rooms of a historic house on the grounds the conference center, with ample time after lunch to take a walk in the nearby gardens. On one evening we’ll have a reception at the National Humanities Center, where SCI participants will have an opportunity to talk with fellows and staff of the Humanities Center as well as invited guests from nearby universities. And on other evenings there will be optional small group dinners at various restaurants in Durham and Chapel Hill, with visits to Duke University and the University of North Carolina along the way. However, almost all of this is flexible. Last year, we adjusted the schedule along the way, based on suggestions from participants, and in response to observations about how useful different types of activities were at different times of the Institute. Mealtimes are fixed, but aside from that the schedule is fair game. What there won’t be at the Institute are PowerPoint slides. No reading a prepared talk, no deciding which conference track you’re going to attend, no vendor sales pitches. Alright, maybe there are a few presentations, but they’re brief and mostly about sparking ideas and setting tone. We’ll have some brief remarks at the receptions, and on the first day, Tom Scheinfeldt will be opening the Institute meetings with some observations on setting the conditions for a productive retreat. On the last day each team will practice their “elevator pitch” with SCI’s advisory board, answering these questions about their project: What? So what? and What next? The participants will come together on October 11 mostly not having worked together or even met each other before, and will leave on October 15 having started new collaborations, incubated new ideas, developed new plans, and built new things. They will also have eaten well, relaxed away from their usual work, and, we hope, made new friends. 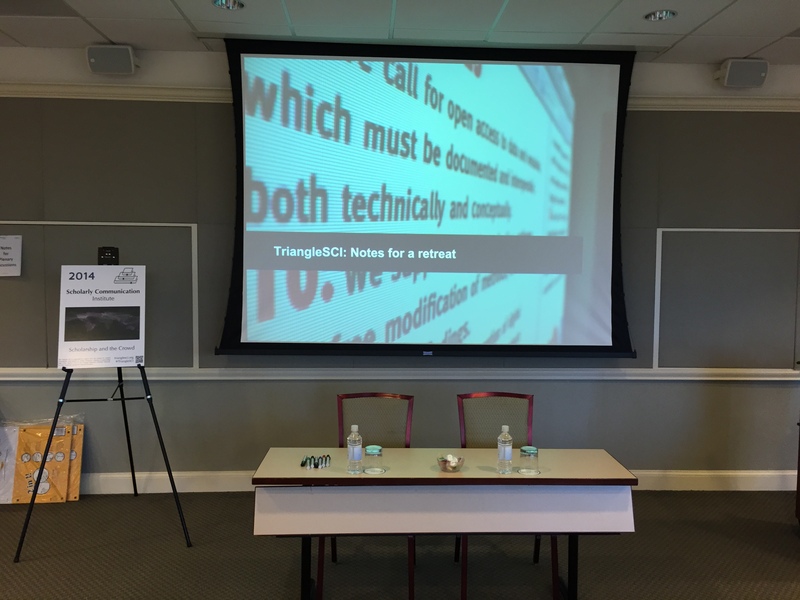 Over the next few weeks you’ll be able to follow the progress of the 2015 Triangle Scholarly Communication Institute via the #TriangleSCI hashtag on Twitter, and afterwards, via this blog. To get a sense of what it was like last year, see this Storify thread that collected a representative sample of tweets from SCI 2014, and these blog posts from SCI 2014. And if you’re interested in participating next year, keep an eye on this blog for the next RFP, to be announced in early 2016. This is the third in a series of posts about each of the teams that will be attending SCI 2015, and their projects. This one is adapted from the text of the proposal submitted by Daniel Powell. Digital scholarship is often a deeply collaborative and networked enterprise, one which – in its various forms – involves multiple practitioners from a variety of academic contexts. This working group believes formalised evaluative structures have not kept pace with either the realities of social knowledge creation or with the numerous technological efficiencies provided by digital tools and platforms. Credit, promotion, funding, and credentialing are more complex topics than ever, yet many individuals and institutions rely on simple, outdated strictures to make judgements. How should institutions of higher learning, and individuals embedded within those institutions, value and evaluate networked knowledge production undertaken in wide-ranging collaboration using networked digital tools? What is the role of digital methods and platforms in developing new pedagogical practices and curricular structures that foster digital scholarship in university classrooms? How are such tools being deployed to bridge the troubling gap between bifurcated models of “teaching” and “research” as discrete activities? What is the role of mentored praxis in evaluating intellectual labour and student progress? How can we rethink traditional models of authorship and intellectual production to ensure that the work of heterogeneous teams of knowledge producers – teams that can and do include the general public, research stakeholders, students, faculty, alternative academic staff, librarians, computer IT professionals, etc – is accurately understood and valued? What can we do to rethink traditional models for publishing and editorial practices, graduate and undergraduate standards for evaluation, and tenure and promotion guidelines to make them more effective in networked knowledge environments? Overall, our objective is to link discussions of social knowledge creation (crowdsourcing, labour practices on digital projects, wiki culture, etc) with heterogeneous knowledge producers (undergraduate students, graduate research assistants, library personnel, altac staff, etc) to produce new ways of understanding how to measure and evaluate digital scholarship. Pragmatically, we hope to use this working group to promulgate evaluative standards and guidelines for faculty, administrators, students, and staff working within and around digital scholarship. In this effort we build on the robust foundation developed by, among others, the Modern Language Association, whose efforts in various workshops, publications, and committees have begun these conversations. [For a summary of this work, see the 2011 issue of Profession, published by MLA and available for free here: http://www.mla.org/profession] The MLA Guidelines for Evaluating Work in Digital Humanities and Digital Media – themselves the culmination of several years’ work on the topic – recognises, for example, that digital scholarly practitioners “engage in collaborative work” far more often than their non-digital counterparts, but stops short of recommending specific frameworks of evaluation. Compounding the difficulties inherent in formally evaluating digital research is the collaborative involvement of students, graduate researchers, library staff, etc. The struggle for evaluators is not limited to form (archive, blog post, database, source code) but also encompasses disciplinary norms and shared authorship practices. We hope to blend these two concerns – digital scholarship as form and digital scholarship as collaborative process – to discuss and share guidelines that address credit, mentorship frameworks, and scholarly merit for digital work. In a theoretical sense, we hope to confront the emergent body of evidence and scholarly products that indicate a qualitative change in how knowledge is produced in a networked age. By this we mean the shift from single-author, long-form prose research (especially in the humanities) to distributed models of intellectual production that intersect with social media connectivity, digitally facilitated coauthorship, and well-defined and traceable patterns of intellectual contribution. Social knowledge creation is quickly becoming a fact of life for digital scholarship, as is the reality of iterative, long term development for digital projects. A survey and examination of existing documentation and guidelines related to digital scholarship and collaborative knowledge production. Much of this can be compiled prior to SCI and brought to bear immediately on early discussions. Qualitative discussion and sharing of the institutional experiences with pedagogy, digital scholarship, and professional evaluation our working group allows. In this we will leverage the diversity of voices we have brought together at SCI. Synthesis and creation of holistic guidelines and documentation for moving conversations on this topic forward in multiple departments, institutions, and scholarly organisations. These are intended for practitioners of scholarly work in digital form and in large teams to use in situations of tenure, promotion, and credit apportioning. In large part, the challenges to new systems of evaluation and credit are not technological or infrastructural per se. Instead, they are social, habituated by longstanding disciplinary norms and expectations. They are deeply embedded in administrative norms and processes, from informal expectations to the literal paperwork used within evaluative frameworks. They find expression in tenure & promotion guidelines that ignore collaborative work or frame digital scholarship as service; in evaluation frameworks like the Research Excellence Framework in the United Kingdom or the Excellence in Research for Australia which overvalue monographs in rigid point based systems that determine funding; in requirements for depositing dissertations that preclude, by definition, digital work; and so on. Our hope is that the documents and discussion that emerges from SCI on this topic can serve as an insurgency against those forces that stifle innovative research and actively separate “researchers” from other knowledge producers on digital projects. Our working group has come together around a single idea: that to best discuss how collaborative and cross-demographic digital scholarship should be evaluated, multiple voices and viewpoints must be represented. To that end, our group is diverse: tenured, internationally known researchers in the digital humanities and e-literature; undergraduate students working on digital scholarly projects; advanced graduate students who have participated in large-scale collaborative projects; alternative academic staff dedicated to fostering digital scholarship at small liberal arts colleges; early career and tenured faculty devoted to digital knowledge production at teaching-intensive undergraduate institutions; and digital scholarship librarians invested in altmetrics and distributed communities of practice. We represent departments of English and Digital Humanities, large research libraries, several digital research laboratories and centres, and Andrew Mellon funded initiatives. Geographically, we represented the United States, Canada, and the United Kingdom. Together, we represent a cross-section of digital scholarly practices in contemporary academia. Relationship to SCI 2015 theme. In exploring what it means to be an author and how to value, attribute, and reward the work of multiple contributors, we hope to push for a redefinition of the author/researcher that encompasses individuals who are often excluded from such discussions, especially in pedagogical and mentorship contexts. In surveying varied systems of incentives for digital scholarship, we anticipate finding an emphasis on single-author monographs and articles. The process of challenging these norms from the multiple viewpoints of our working group – teaching faculty, librarian, student, tenured researcher – will allow us to synthesise what these frameworks should be. In addressing the relative value of innovative digital scholarship to multiple audiences and users, we envision an opportunity to synthesise pedagogy, knowledge creation, and diverse disciplinary activities in a more holistic framework. In other words, digital scholarship forces us to reconsider the existing separation between teaching and research, as well as the ‘research’ and ‘service’ functions of university departments and organisations. Dene Grigar is an Associate Professor and Director of the Creative Media & Digital Culture Program at Washington State University – Vancouver. Her research focuses on the creation, curation, preservation, and criticism of Electronic Literature. This research relies on a deep knowledge of media production and is expressed through traditional publications (e.g. essays, articles, chapters) but also through varied activities involving curated exhibits and multimedia design. Her work has historically found itself at the cusp of changes wrought by the evolving notions of literature and associated literary activities as they are impacted by digital media and, so, has been continuously evolving in response to technological and cultural considerations. As Director of an academic program in a new and emerging field, Grigar has had to find ways to credential faculty, demonstrate scholarly viability of collaborative research, and develop assessment documents that evaluate excellence. She brings 25 years of teaching experience in higher education to our working group. Aaron Mauro is Assistant Professor of Digital Humanities and English at Penn State Erie, The Behrend College. He is the director of the Penn State Digital Humanities Lab at Behrend (sites.psu.edu/psudhlab). The Lab currently oversees three research projects, including the EULA Tool, the 12th Street Project, and the Hammermill Archive. As co-chair of the Digital Media, Arts, and Technology program at Penn State Erie, he teaches regularly on diverse topics relating to digital culture, computational text analysis, and scholarly communication. His articles on U.S. literature and culture have appeared in Modern Fiction Studies, Mosaic, and Symploke among others. He has also published on issues relating to digital humanities in both Digital Studies and Digital Humanities Quarterly. Mauro will bring a unique perspective that bridges research, teaching, curriculum development, knowledge mobilisation, and collaboration with the scope and spirit of the liberal arts. A web-based and public facing collection of relevant guidelines, documentation, and academic publications. This might collect documents promulgated by scholarly associations on evaluating digital scholarship (such as the MLA, AHA, and various universities and consortia); publications on practitioner experiences in these areas; examples of collaborative digital projects that have modelled evaluation practices; and working group narratives of their experiences in existing evaluation frameworks. A white paper exploring the issues here outlined, emphasising especially the intersection of collaborative knowledge practices, pedagogy, and non-tenure track research activity in digital forms. This would also contain our synthesised insights into the current state of play in this area. An appendix to the white paper consisting of well-defined guidelines and recommendations for evaluating collaborative scholarship in pedagogical contexts. This can serve as a starting point for further discussion in numerous institutional contexts. A glossary of existing digital scholarship platforms that are being used to create collaborative scholarship. This might include wikis, CommentPress, the Google Drive platform, etc. A special emphasis will be put on tools & platforms used in pedagogical contexts. More generally, it is our hope that SCI participants – in our working group and in the wider institute – take our insights and documents back to their local institutions and organisations to prompt local conversations. Our document outputs and web resources can have a cascading effect, being deployed in multiple contexts for diverse purposes.